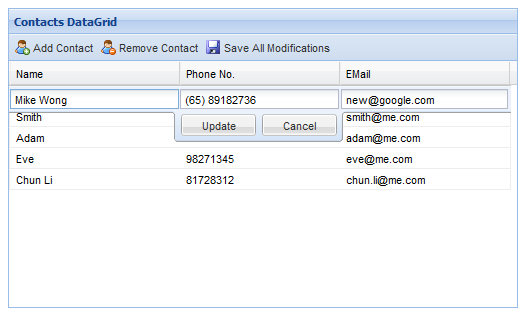 This short tutorial will walk though the implementation of DataGrid using ExtJS 3.3.1 andASP.NET MVC 3. In this tutorial I focus more on the integration of the front-end, so you will not find any database code. Whenever we deal with data we usually create, read/retrieve, update or delete them. ExtJS provides a great data grid component and the ability to perform CRUD operation with very little coding. I used JSON as data format in the example below. Let’s start with the server-side by developing the data model and controller. 34 message = "Create method called successfully"
45 message = "Update method called successfully"
56 message = "Delete method called successfully"
Now, you move on to the view and work on the ExtJS. First, you define the record type which matches the server-side object. Then, setup a proxy to define the connection to the controller. Hooks the above components (reader, writer, proxy) to the store. When submitting data as JSON, set the headers “Content-Type” to “application/json” in the proxy object and set the encoding to false in the JsonWriter. If not, it will be treated as form submission. Since I set the auto save to false. DataGrid will submit list of contact when there are 2 or more changes, however it will send a single object when there is 1 change. In order to make it consistent to send as list, set list full to true in the JsonWriter. ASP.NET MVC 3 able to recognize the JSON without additional coding. If you want to see the complete source code, download it from here. Hope it’s useful. Access to the data source varies depending on the source of data. Access to persistent storage, such as to a database, varies greatly depending on the type of storage and vendor implementation. The ODBC API enables applications to use SQL statements. However, even within RDBMS environments, the actual syntax and format of SQL statements vary depending on the particular database product. There is even greater variation with different types of persistent storage. Access mechanism, supported APIs, and features vary between different types of persistent storage, such as RDBMS, object-oriented databases, LDAP, flat file, XML file, and so forth. Such disparate data sources make challenges to applications, and can potentially create a direct dependency between the application and the data source code. When business components need to access a data source, they use the appropriate APIs to create connectivity and manipulate the data source. But including the data access code within business components introduces a tight coupling between the business components and the data source implementation. Such code dependencies make it difficult to migrate from one type of data source to another. When the data source changes, the business components have to be changed to handle the new type of data source. Use the Data Access Object to do all manipulations to the data source object. The DAO manages the connection with the data source to get and store data. The DAO implements all access functionality to work with the data source. It doesn’t matter what the data source is. It could be any persistent storage such as RDBMS, a repository like LDAP, or even just XML files. The business components that rely on DAO use a simple interface exposed by DAO to its clients. The DAO doesn’t show the data source implementation and there is no need to do this. Because the DAO interface doesn’t need to change when the underlying data source changes, this ability allows DAO to adapt to different types of storage without having to handle it within the business component. You can also say that the DAO acts as an adapter between the components and the data source object. This object represents the data client. It’s the object that requires access to the data source to obtain and modify the data. This object is the underlying object in this pattern. It abstracts the data access implementation for its clients to enable transparent access to the data source. The business object delegates the data creation and stores actions to the data access object. This object represents a data source implementation. It could be any persistent storage, for instance, RDBMS, OODBMS, XML repository, flat file system, and so forth. This object represents a data carrier. The data access object uses this object to return the data to the client as well as to receive updates and create the data in the data source. I provided this sample project with two kinds of DAO: XmlRepository and MSSql. This sample project demonstrates how easy it is to use this pattern. It also shows that any migration from one data source to another is a piece of cake. As you can see, I use the abstract factory model. 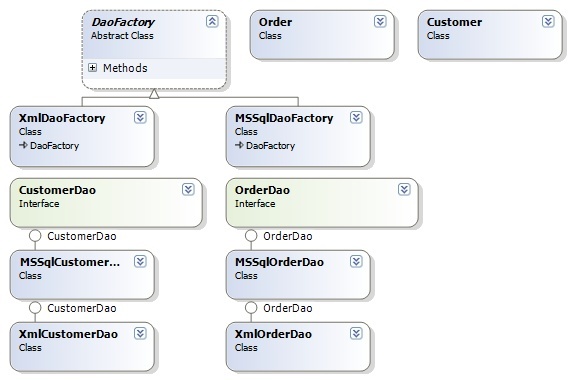 DaoFactory is the abstract class for all DAO factories. The implementation for XmlDaoFactory is the same, except specific changes. XmlDaoFactory doesn’t have the connection string, but it has paths to XML files. There are only two business objects in this project: Customer and Order. So we need to have two interfaces: CustomerDao and OrderDao. These interfaces describe the base data access functionality for all DAO implementations. Once you add a new interface method, you have to modify all DAO implementations of the interface. The implementation of XmlOrderDao is specific because it uses XML files to store the data. The transfer objects are used by DAO to send and receive data from the data client. It’s pretty simple to use DAO from the data client. The Web Service classes in this project act as business objects or data clients. As you can see, the data client hasn’t any understanding what is the data source. The DAO abstracts all manipulations to the data source. Notes: Currently, in this code, the default DAO is the XML repository as it can work standalone. It will store the XML files locally in the App_Data folder (be sure that the ASPNET user has write permissions on your machine). If you are going to use it with MS SQL, you have to modify the web.config file. You need to comment the XMLDaoFactory code and uncomment the MSSqlDaoFactory code and also specify the connection string to your database as well to execute the SQL script that is in the SqlInstall folder. That is all what you need to migrate from one data source to another.